National 4-H Week, once held in the spring, is now held in the fall. Read the history of this commemorative event. 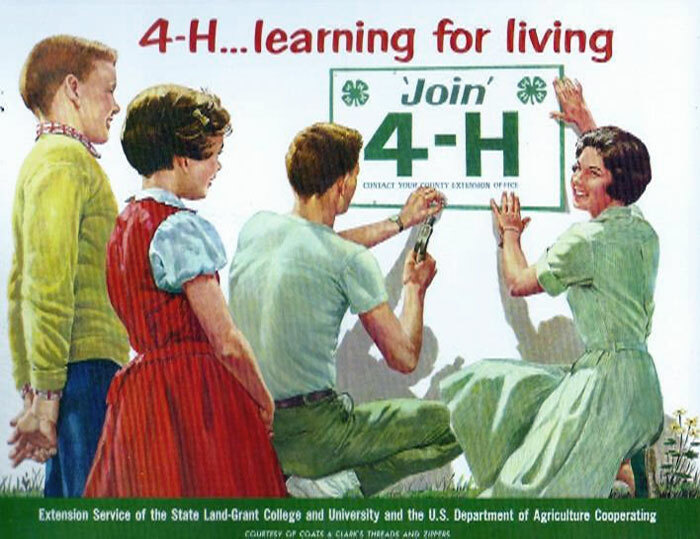 This National 4-H Poster was premiered during the first 4-H week held in the fall. What year do you think it was? The older girl’s 4-H uniform might give you a slight hint. 4-H has long featured aeronautics and space exploration; there was even a 4-H flag taken into space on a NASA mission. This year’s theme of National 4-H Youth Science Day is “Aerospace Engineering” and will include rocket projects designed by University of Arizona. The final installment of our series on the two 4-H musicians at 4-H Congress in the 1950s features Maryland 4-H’er Helen Bovbjerg (now Niedung), a lyric soprano whose career, she says, was significantly boosted by her 4-H experience. “Hands-On” 4-H highlights career preparation in 4-H; get your club to discuss the impact of 4-H on peoples’ lives. Read what participants at the 2014 FilmFest 4-H said about their experience in St. Louis and making films, and see the winning films from “Voices of 4-H History” category. Next month, we’ll feature the 2014 National 4-H Hall of Fame Laureates. This coveted honor goes to people who have made (and many continue to make) significant contributions to the success of 4-H. Many of the honorees are 4-H Pioneers, whose historical work helped shape today’s 4-H program. Yes, fall is a busy time for 4-H, but take a few minutes to relax and read this month’s History Newsletter; enjoy! This entry was posted in 4-H History Preservation Newsletter, National 4-H Week and tagged National 4-H Week, Newsletter by NewsAdmin. Bookmark the permalink.